Trek through the unforgiving Kokoda trail, follow the footsteps of the Aussie diggers, and reap the rewards of heart-stopping views and local hospitality. If you’ve ever wanted to see a world that few have glimpsed, and even fewer have understood, that place is Papua New Guinea. Western footprints have barely encroached its thick jungle, and scientists are still baffled by what lies within. As you scale the slopes of the Kokoda trail, traipse through its marshes, and tiptoe its rickety river-crossings, you’ll meet with views like no other and isolated villages that are nothing short of amazing. Experience the spirit of the ANZAC while hiking along this challenging but historically enlightening trail. Be greeted by local villagers and welcomed by the Siosi family, the owners of the cooperative guesthouse you’ll stay in. Efogi II is the largest of the Koiari villages along the trail with an estimated population of 400-500 people. Papua New Guinea’s astounding diversity makes it the most heterogeneous country in the world. Over 800 different ethnic groups live here, with their own unique culture and languages. It’s also is one of the least developed countries, and only a small percentage of the population live in urbanised areas. Most people live traditional agriculture-based lifestyles in their natural surrounds, with little reliance on money and modernity. There is, however, western-style schooling in many villages. Although over 90% of the people identify as Christians, they practice a synthesis of Christianity and their indigenous belief system. Papua New Guinea is a country just north of Australia, comprising of several islands. The largest of these is New Guinea, which is split down the middle and shared with Indonesia. The main island is crossed from east to west by the New Guinea Highlands mountain range and is almost entirely covered by tropical rainforest. Papua New Guinea also has significant areas of wetlands and is surrounded by protected coral reefs. As the country is located along the Pacific Ring of Fire, it’s got active volcanoes which erupt frequently and is susceptible to earthquakes. What nationalities need a visa for Papua New Guinea? All visitors to Papua New Guinea including tourists are required to have a visa to enter and all nationalities must apply for their visa prior to travelling to PNG. Currently a 30-day tourist visa is available for nationals of many countries including Australia, Japan, New Zealand, UK, USA and most western European countries. This tourist visa is non-extendable and is issued free of charge. You can obtain your visa application form through your travel agent or by downloading a form online from the Papua New Guinean High Commission website. Your completed visa application needs to be sent your nearest Papua New Guinean High Commission, embassy or consulate along with your valid passport (which must have at least 6 months validity on it from the date of intended travel) as well as a pre-paid, self-addressed and registered post envelope which will be used to return your passport to you. Please note that visa processing times can be subject to delays, particularly during peak periods, so we recommend you allow sufficient time when applying for your visa. Tipping isn’t expected in Papua New Guinea but if you’ve received good service consider a 10% tip. What is internet access like in Papua New Guinea? Service can be slow and intermittent even in major towns. Can I use my mobile/cell phone while in Papua New Guinea? Reception is poor in most areas. Ensure you have global roaming activated with your carrier if you wish to use your phone. What are the toilets like in Papua New Guinea? It's likely that you’ll encounter different types of toilets while travelling in Papua New Guinea. Western-style flushable toilets are commonly found in high-end resorts, hotels and restaurants, while squat toilets are common in rural areas and homes. Be prepared by carrying your own supply of toilet paper and soap, as these aren't always provided. Can I drink the water in Papua New Guinea? Drinking tap water in Papua New Guinea isn’t recommended. For environmental reasons, try to avoid buying bottled water. Fill a reusable water bottle or canteen with filtered water. It's also advisable to avoid ice in drinks and peel fruit and vegetables before eating. 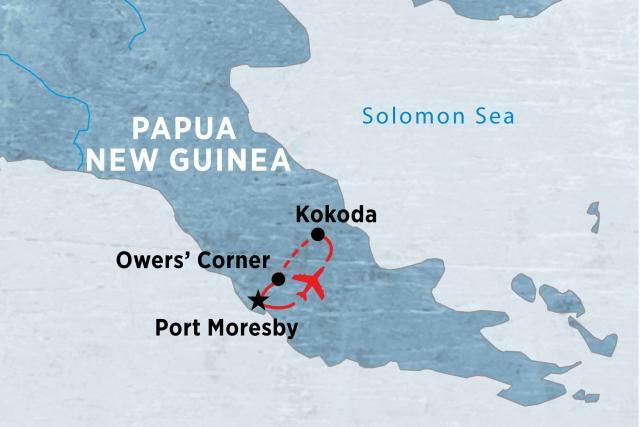 Are credit cards accepted widely in Papua New Guinea? Credit cards are widely accepted in major towns. What is ATM access like in Papua New Guinea? There’s good access to ATMs in Port Moresby. Do I need to purchase travel insurance before travelling to Papua New Guinea? Absolutely. All passengers travelling with Peregrine are required to purchase travel insurance before the start of your trip. Your travel insurance details will be recorded by your leader on the first day of the trip. Due to the varying nature, availability and cost of health care around the world, travel insurance is very much an essential and necessary part of every journey. What public holidays are celebrated in Papua New Guinea?